Our vision and mantra is "Opinions matter", it means a lot to us. Our fundamental belief is that opinions is one of the most important assets in today's society, in general but more specifically also in social media. We do not typically talk about influencers, we rather talk about opinionaters. Opinionaters then usually gain influence through their opinions and consequently becomes influencers. Followers and friends are important. For sure. But it is not the only thing that matters. In fact, we believe it is a poor proxy for your influence in social media. Once you have signed in to Bumblewing, we measure three things. Recognitions, i.e. the number of likes you receive on your posts. This is evidence that people are reacting to what you are posting. Engagements, i.e. the number of comments and mentions related to your post. This is evidence that you manage to engage your followers and friends through your posts. Viral actions, i.e. number of shares and retweets for your posts. This is evidence that your followers and friends REALLY like what you are posting. Recognitions, engagements and viral actions is measured for each connected social media platform and then ranked against other influencers in the Bumblewing network. Ranking is based on total number of actions (Recognitions + Engagements + Viral actions) for each user and each social media platform is ranked individually. If you are ranked as number 1 in the Bumblewing network for a specific social media platform, you will receive the score 100. Here at Bumblewing we have a clear perspective on how influence is achieved, after all that is what we do. We believe influence can be achieved by having really high action rates, this means in reality that a large share of your followers and friends act on your posts. Action rate is measured as total actions received in relationship to the number of followers/friends you have, action rate is measured individually for each social media platform. Another way of achieving influence is to make sure you grow your own network, i.e. number of followers and friends. The real stars in social media manages to combine high action rate with a large network, but that is hard. Greenfielders: This is where everybody starts, with a relatively small amount of followers and friends and with relatively low action rates. Hey, its a start! Broadcasters: Relatively low action rates, but sometimes instead with an insane amount of followers and friends. Good broadcasters clearly and with possible good influence. Experts: Not necessarily an impressive amount of followers and friends, but hey do they listen and react to your posts. Clearly an expert with good influence. Stars: The hardest position of them all, the stars. High action rate towards large amount of followers and friends. Influence nirvana! So why does this matter at all? Because it is superduperimportant of course. It means you need to think about what you post, because that is what potentially can improve your action rate. Followers and friends react to interesting and good posts, and care less about the rest. You need to know your followers and friends, simple as that. And do we even need to talk about the tempting opportunity of buying followers and friends, didn't think so. Recognitions, engagements and viral actions are measured on a 7-days period. This means that we as an example aggregate the number of actions you achieve on posts posted last seven days. We always look 7 days back. This means that your score and your ranking actually has the possibility to move up pretty quickly. It also means that if you take vacation for a couple of days it will actually hit your score. Exactly the way it should be! When you look in the network data section of your dashboard, this data represents your 7-day statistics. This is the basic data used for all calculations in Bumblewing. When calculating your influence, i.e. actions achieved, this number represent the average per post, based on the 7-day history stored in the network data section. Clear enough? Network data: Aggregated numbers based on your activities on connected accounts for the last 7 days. Action rates: Average rates in % based on the 7-days historic data, i.e. actions related to your followers amount. 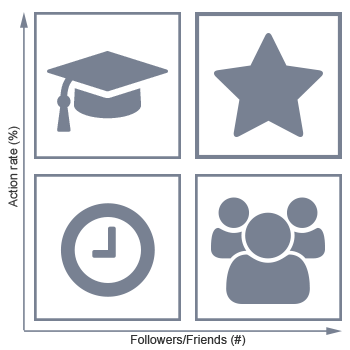 Influence: Average influence, measured as average number of actions per post. Calculated based on your 7-days historic data. Simple: It should be simple enough. This means you should understand why you e.g. get score 63. As a consequence of this we keep the number of parameters to a minimum. Transparent: We are not hiding anything from you. Our aim is to make the scoring and its principle as transparent as possible. If you are ranked as number one in a social media platform, you will get 100 in score, if you have the lowest possible ranking in the network you will get 0. Each social media platform is ranked individually. Profile completeness is achieved by filling out the simple profile page here on Bumblewing, it should actually be pretty straight forward. The total Bumblewing score is based on ranking of sum of actions achieved cross the different social media platform connected for all users in the network, so it might actually benefit you to connect all of the platforms you use. If you are ranked as number one in the network (highest amount of total actions achieved) you will get score 100!